Some of the differences are predictable, but others aren’t. The space around us that we are used to even changes how we see. 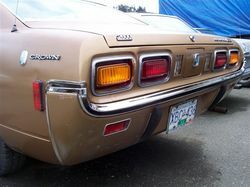 When Japanese automakers began to export cars in the sixties, the designs seemed very strange to Western eyes; the Japanese designers were concerned with details, but the Westerners stepped back and looked at the overall impression. The details were finely crafted, but to Western eyes, there were too many of them crowded onto too small a surface. Westerners generally prefer larger, less crowded rooms, and sometimes feel crowded and uncomfortable in rooms that feel “just right” to Japanese. In an apartment I used to live in, an old girlfriend would always close all the 襖 (fusuma) when she visited; she said it made wherever we were sitting “more like a room.” Well, that tiny room made me feel claustrophobic. I liked all the 襖 (fusuma) open (or removed!) to give a feeling of space. I imagine some Japanese might feel this made the apartment seem 寂しい (sabishii). I can remember one of the adjustments I had to make in my early years in Japan; as I practiced my photography, I gave up using my telephoto lenses and had to buy an extra wide-angle lens or two. Everything felt too close. Because we all live so close to each other here in Japan, we have to learn how to "not see" certain things. You may remember our discussion of 文楽 (bunraku) and 建前 (tatemae) in Chapter Seven. In countries where there are relatively few people around, and one’s nearest neighbor can be miles away, this skill never gets learned. Learning that one needs to close one’s eyes to reality can be a contributing factor to culture shock, which we will discuss in Chapter Fifteen. This includes behaviors like holding one’s hand over one’s mouth when using a toothpick, or thinking of paper 襖 (fusuma) as “walls,” or groups of friends out together while each is doing something completely different. Wherever one looks, someone else is doing something that is best not seen, so one needs to learn how to "not see." Things get even more interesting, however. In the west, strangers almost never touch. Any accidental brushing against a stranger requires an immediate apology; failure to apologize after touching a stranger is considered very rude. This is true on the street, in stores, in elevators, and on trains, buses, or planes. In fact, in my hometown, bumping someone is usually considered an attack, or a provocation for a fight. Wherever one is, a distance is always maintained between strangers - except for emergencies, of course. People line up carefully, board buses or trains one at a time, and when it becomes too crowded to allow for that comfortable distance, people stop boarding and wait for the next elevator, train, or bus. To push oneself beyond this point would be very rude. A “full” bus in Chicago holds only about half of the people it could hold in Japan - and it’s not entirely because the Chicagoans are fatter (though they probably are)! Imagine the confusion of a Westerner from this culture on his first rush hour train ride in Osaka. People bouncing off each other through wickets and on platforms, people cutting in line, pushing and shoving on the train, and strangers with their bodies pressed up against each other. Try to explain to this Westerner why all this touching is OK, but that grabbing the shoulder or patting the back of an acquaintance when meeting will make him feel uncomfortable. Why is it OK to press yourself against a stranger on a train, but not OK to hug an acquaintance when you meet him or her on the street? One of the points of confusion is the idea of personal space, and what that space means. In Japan, the personal space zone is often decided by context - the where and when, rather than who. This makes sense in a place where space is a luxury. In more spacious countries, there is almost always enough space, and, therefore, different rules apply. People in these cultures can use the space to help them express feelings about relationships - it’s who that becomes important. As people get to know each other better, they are more comfortable letting the person be physically closer. The personal space zone is smaller when the person is close to you, larger when it’s a stranger. Now, think again about that poor Westerner on a Tokyo rush hour train. 1. What seemed strange about Japanese cars to Americans in the 1960's? Why? 2. What is it about space in Japan that might make Americans and Australians uncomfortable? 3. Why did my Japanese girlfriend and I have problems with my apartment? 4. How might customs of countries with very little space and of countries with a lot of space differ? 5. Try to make five rules about "touching" for a person visiting Japan for the first time. 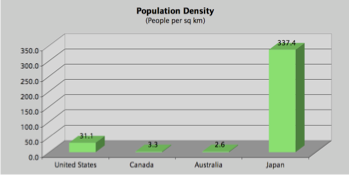 1 You can find the sizes, populations, and population densities of various countries on Wikipedia <http://en.wikipedia.org/wiki/List_of_countries_by_population_density>.